Foster presents CHARITY CHALLENGE! Join us in raising awareness and funds for a local non-profit organization in Owosso. 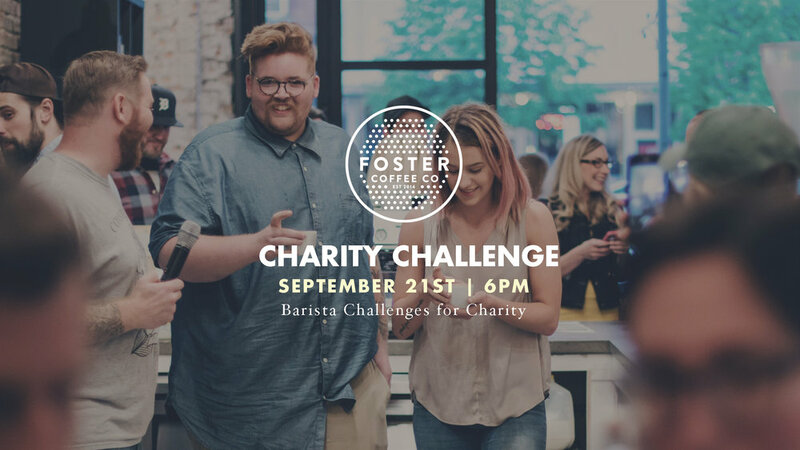 Enjoy a fun night of family rivalry as our Foster baristas show off their coffee skills, and not so coffee related skills, in several rounds of fun and competitive challenges. 1st place will win the grand prize of being able to lovingly pie our owners and co-founders in the face. All donations, sponsorships, and proceeds go towards the Shiawassee County Child Advocacy Center. Their mission is to to protect children from violence, neglect, trauma and pain, so that they can grow into healthy, strong, well-adjusted adults. They help families who have experienced abuse face their fears and find the hope to rebuild. Learn more about their organization at the charity challenge. Sponsor your favorite Foster barista. Come support a local cause to help protect children. *Competition is restricted exclusively to past and present Foster staff (we’ll do the embarrassingly fun stuff). Public is welcome and encouraged to watch, cheer, and sponsor their favorite baristas.